Boston Glee Party (c/o Si.com). And so the NHL season is finished. 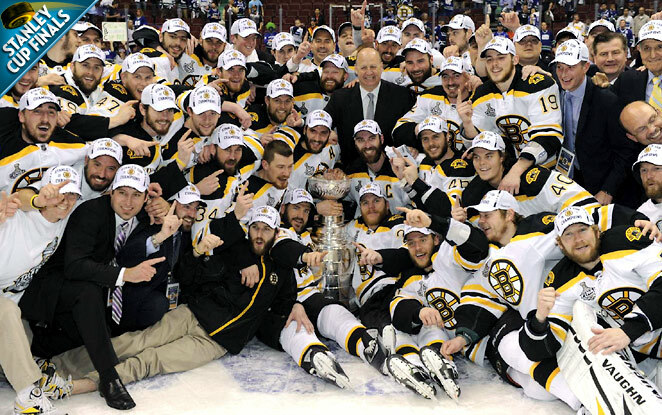 The Boston Bruins somehow won the Stanley Cup, beating the Canucks in Vancouver and winning the Cup despite going to Game 7 in three rounds of the Play-Offs. Amazing. Sudden-death Game 7 wasn’t even a nail-biter, with the Bruins wiping the locals, 4-0. The two goals late in the second period were killers. I still have no idea how the Vancouver goalie, Roberto Luongo, let the third goal find its way into the net. And well played, Sports Illustrated Online, which immediately came up with the headline: Boston Glee Party. I propose renaming the Bruins to “Tim Thomas and the Bruins”. I know … sensational. Isn’t Boston full of Paul Revere stuff? Out Revere statues, in Thomas statues.